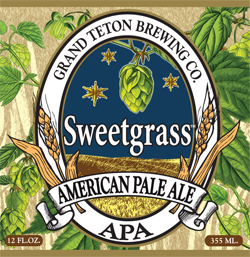 A gold medal winner at the 2009 Great American Beer Festival, Sweetgrass is brewed with two-row pale barley, German, Vienna and CaraAmber malts; hopped with Columbus, Galena, Zythos and Cascade hops; and dry-hopped with Bravo hops. A bronze-colored beer with a dense collar of foam. Sixty units of bitterness suggest a big, hop-forward beer. But the hops don’t knock you off your feet and work in harmony with the rich biscuit character of pale, Vienna and CaraAmber malts. The palate continues the theme of powerful hop bitterness mellowed by rich grain notes and tart lemon fruit. The finish has a lingering note of sweet barley, balanced by tangy citrus fruit and spicy hops. It has a beautiful amber color, nearly copper, with a head of foam that would make any brewer proud. The nose is puzzling, though; not much in the way of hops, but something more like overripe citrus, a bag of oranges in its last days. The bitterness is robust and clean, but the palate somehow never quite focuses or becomes lively. This is a perfectly OK beer, but there’s a great one hiding in there somewhere. It needs a bright note. Then again, there’s nothing wrong here that a good cheeseburger won’t fix.